Palio is the annual tradition, that states back to 1644. How to explain Palio? A poet Mario Luzi says about Palio ; ” Palio is Palio. No sociological, historical or anthropological theory could ever explain it. It is the sublimation and the damnation, together with the destiny of every single sienesian and his and hers citizenship. It is the furious fire of being senesian. and in any case a unique confirmation of it”. Palio is a competition, raced by horses, between the 17 contrade, the different districts of the town. Each one of the contrade has a race horse, that the quarters people cheer during the to races, 2nd July and the on 16th August. The palio is run with ten horses, that are extracted the last Sunday of May. The extraction day is almost as important than the actual palio, as it confirms which horses will be running. Seven horses, who did not run in July, will run in August and three that run in July, are extracted to run again. The horses are blessed in the church by the bishop before the races, and the winner horse enters to the church after the race, together with the ‘fantino’ the jockey and the winning contradas, and the palio, a painted material with Madonna, that the winning theme brings around town all night after the race. The race is quick, the horses run only 2 laps. Sometimes it takes hours to get the start right. Before the start there is extracted the track order. The horses need to stand in line, before the race can begin. And once it begins, it’s pure madness! The jockey may fall, but the horse who passes the finishing line first is still a winner. The horse is the star of the day. There are many opinions about the wellbeing of the horses, but the sienesian say, that the horses are probably better taken care of than many other horses or animals. They have a short carrier and a long and happy retirement in the sienesian hills! 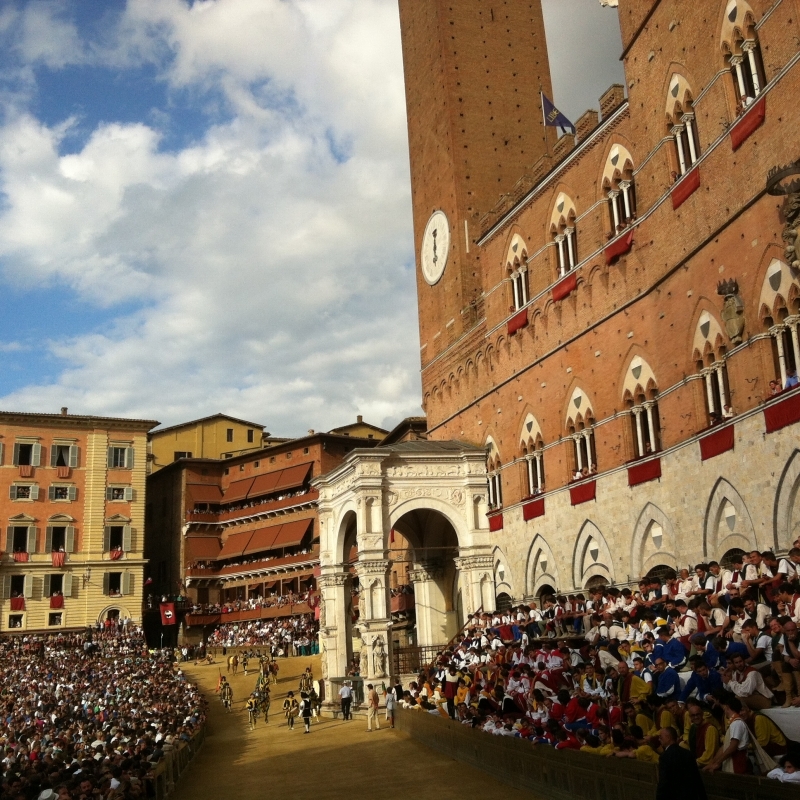 The palio is organised in Piazza del Campo, in middle of Siena. Town is very busy days leading up to palio. On the day it is best to make the way to town few hours earlier, to avoid queues. It is recommended not to bring small children or animals to palio, at least if you wish to enter in the main square. It is free to enter to the square, but leave early, otherwise you may experience crowds and queues. Tickets are sold to the balconies and rows outside the local restaurants. Owners of the buildings around Piazza del Campo may sell tickets to their balconies, which are the top places. Many local people wear a scarf where the symbol of their contrade is painted. Others dress up, for the dinner after words. The day is festive and it is important to understand, that palio is not ‘another local folkloristic happening’, but something sienesian people prepare for and talk about months ahead and after the race. It is a great passion and a tradition, that can be hard to grasp for an outsider. One of those things, that whole Tuscany will follow, if not in Piazza del Campo, in television. And the show is repeated twice a year. Nearest parking places are situated around Porta Tufi. entrance o the ain square is from Piazza del Mercato. Best spots to see the race are the private balconies, roof top terraces and the rows outside the local restuarants, where tickets are sold. In the central area of the square it is not easy to see the horse race, but it is the best spot to get in the palio madness and follow the local people cheering their horses. There are no batrooms, no water, nor any form of services. But don’t let that to lmake you stay home. If you really wish to know Tuscany and get an idea what palio is for the sienesian people, go and experience it! Just reserve time, patience and a bottle of water with you! Stay in Siena also after the race and visit the contradas. See how winners celebrate and how the losers unite. Enjoy the atmosphere in the Piazza del Campo, illuminated and filled with people celebrating the tradition.